It’s looking like a slow traffic week for me posting on the blog this week. I’ve got to catch up on some writing commitments. But I wanted to do a photo post today because I put a few of these on Twitter last week and made people who haven’t played here curious. 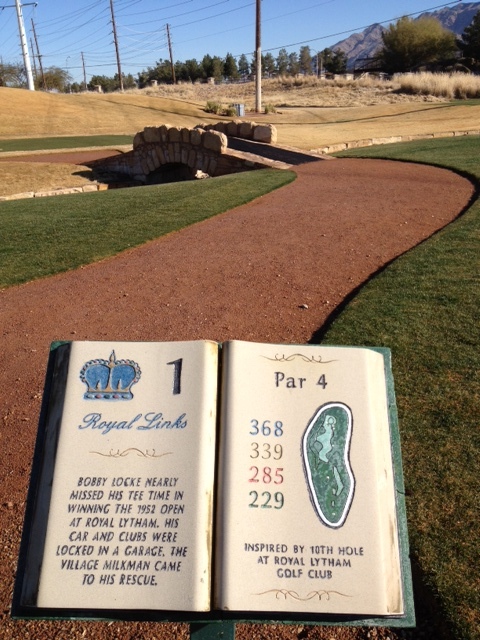 This is Royal Links in Las Vegas. It’s what’s called a replica course, meaning holes that replicate – or for legal purposes are “inspired by” – golf holes taken from the rotation of the British Open courses. There’s something similar for PGA Tour championship courses called Tour 18. Anyway, I played Royal Links last February and thought I was going to make it back last week. Alas, it didn’t happen. So instead of a review, which I will go back to do some time, here’s just a photo fly-by on the course with a little more info. This is the only course I’ve played in Vegas so, unfortunately, I’m not much help with course recommendations, though I know people who have lived in LV and can share their preferences. 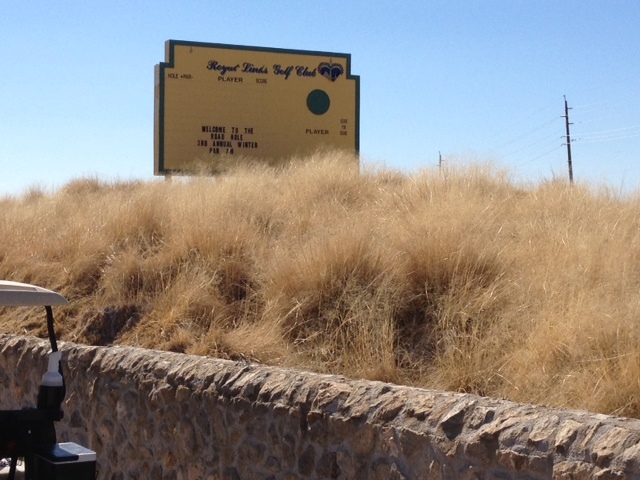 Out of the myriad of golf options in Vegas I chose Royal Links because I was still in golf school at the time and was taking a course design class. We studied links courses, and though I had played links-like courses before, I had never played one that aimed to so closely replicate the look and playing characteristics. To be a true links course you have to located on a body of water – a sea, an ocean, a fjord – so Royal Links doesn’t qualify in that regard, but I did get the wind in the afternoon so I did get to play the course with that other characteristic we ascribe to true links golf. I had a blast. I know others who have enjoyed this place as well. I’ve also heard someone call it “fake.” I don’t know if Old Tom Morris shows up on this person’s Ancenstry.com, but I can only agree in the sense that, yes, I wasn’t actually at St. Andrews. I didn’t recall a plane ride or passport before teeing off, thus, I didn’t have that expectation. But you can bet your gorse that you won’t be wondering if it’s real when you’re trying to recover from waist-high grass on the back. 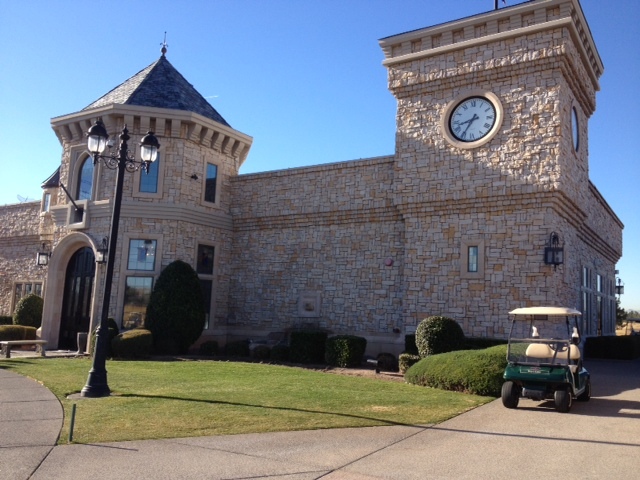 That said, my tour of Royal Links begins at top with the photo of the clubhouse, a castle that can be seen from most holes on the course. The flags flying at the top let you know when the wind has arrived. They do this on every tee. They tell you what hole is being replicated and a little history of the hole. I dig this in a big way. 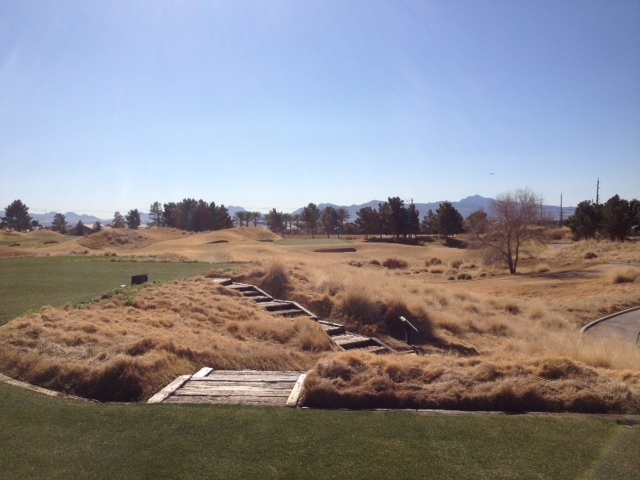 And then you can see the first tee and the bridge that leads to your Open experience in the desert. 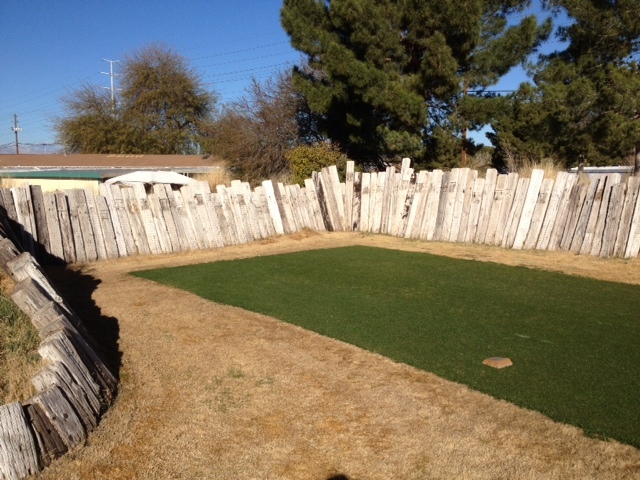 We’ve all seen these tee boxes when watching the Open, right? It’s these little details that Royal Links does a great job of getting right. This is No. 8. Let’s play a little “Jeopardy.” Under “British Open” for $500, Gene Sarazen famously aced this hole during his last British Open appearance. … the Postage Stamp at Troon. As you see, it’s an incredibly short par-3, but beware of the square bunker you can barely see on the right. It’s a tough up and down from there. And it wouldn’t be a links course without hundreds of these lying in wait, right? They give you a yardage book to play the course – and you’d be in a world of hurt without one. 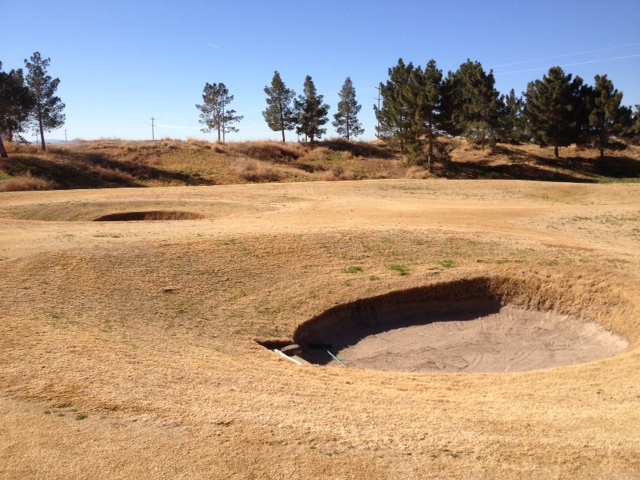 You most don’t see these of the bunkers from the tee. All you mostly see if fairway and green. I didn’t hit a single trap on the front until I finally had the moment I’d been waiting for on No. 9. A long tee shot down the middle found … a bunker. And my only out was a 56-degree wedge. Then my approach found a bunker right thanks to assist from the wind. I took double to dent what was going to be a pretty nice number. And you could hardly have a British Open replica course without the Road Hole from St. Andrews, right? This is the turn and starts you on what I found to be a much tougher nine than the front. I’m proud to say I parred the Road Hole, which is regarded as possibly the toughest par-4 in the world. I drew my tee shot around this sign and found the middle of the fairway. My approach ended up a little long, but short of the wall. I got up and down for 4. And that’s where my photos run out. But I will say, again, that I thoroughly enjoyed my round here and highly recommend it, especially for those who’ve never had a links experience, or one like this. One of the best things about golf is the array of our playing fields, which is something golf has over every other sport in a big, big way. It gives golf character and an ability to adapt to every environment – it’s still the only sport to have been played on the moon. You don’t quite know the game until you’ve known it like this because links is how golf began and has influenced every course every built since. Until you and your clubs can jump the pond, this will do. Tee it up, take it in and take your medicine in the bunkers. Cheers. 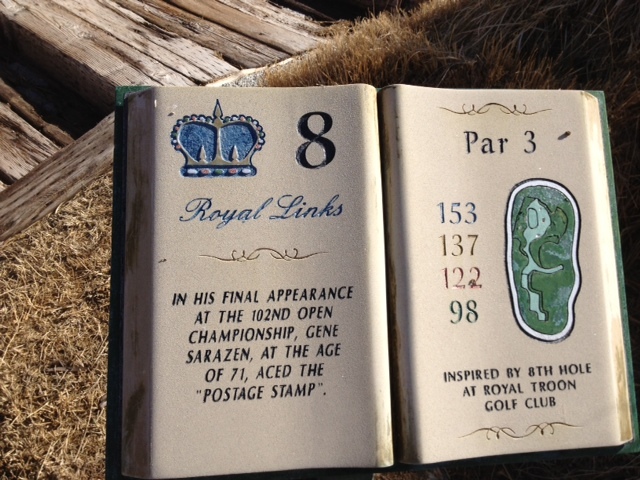 This entry was tagged gene sarazen, Las Vegas, links, Postage Stamp, Road Hole, Royal Links, Royal Troon, St. Andrews. Bookmark the permalink.